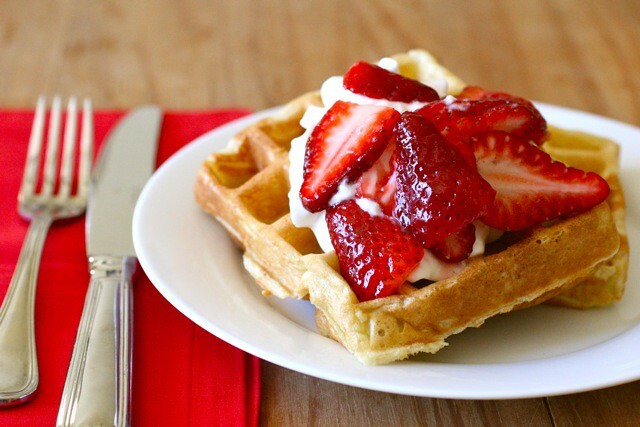 Yield The yield of this recipe depends on the shape and size of your waffle maker. We got about 15 4"x6"-ish waffles from a full batch of batter. Right now I’m really hoping you took heed of my advice last month and made yourself a sourdough starter. Hopefully you, like me, have been enjoying lots of amazing loaves of bread ever since. And if you do have some of that magical stuff sitting around, here is another great use for it: sourdough waffles. If your starter is sitting around in need of a feeding, you have a win-win situation. You can make some of these waffles for breakfast (or breakfast for dinner) and end up with a lovely treat rather than simply dumping some of the starter before replenishing it. 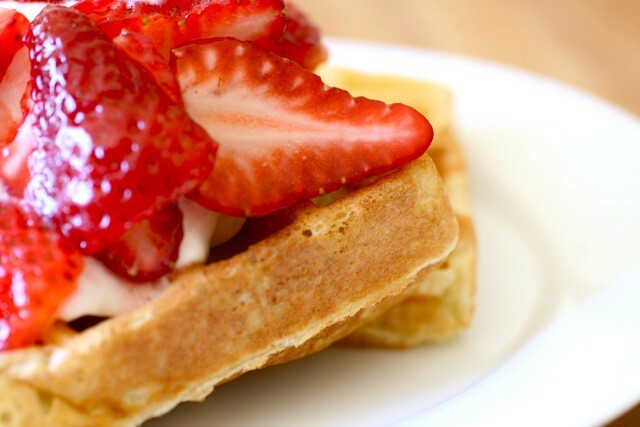 One thing I really love about this recipe is that you mix up most of the batter the night before, so in the morning all you have to do is mix in a few more ingredients and heat up the waffle iron. My father-in-law has been making fabulous sourdough waffles for brunches as long as I can remember. So good, in fact, that whenever you ask Andrew anything about his grandpa, the very first thing he says is, “Waffles!” I’m happy that now we can enjoy them at home as well. When you are ready to make the waffles, preheat a waffle iron according to the manufacturer’s instructions. In a small bowl or liquid measuring cup, combine the eggs and oil or butter. Add to the overnight sponge. Mix in the salt and baking soda, stirring well to combine. The batter will bubble. Pour the batter into the preheated waffle iron and bake according to the manufacturer’s instructions.